It seems that everything has been thought of with this machine, right down to the tiniest user-friendly detail, but are buyers enjoying using this bike? 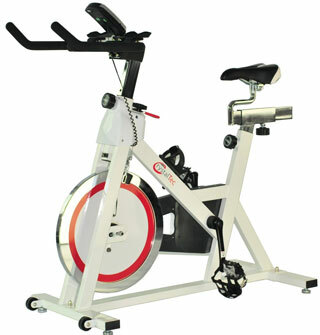 What benefits have buyers noted in their reviews for this CrystalTec Aerobic Training Exercise Bike? Interestingly the most frequent positive comments seem to be about the secure, sturdy frame, rather than any of the more major features. 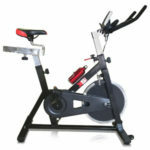 This CrystalTec Exercise Bike is able to hold up to fast paces and aggression when on the highest resistance setting with no sign of weakness, according to many first-hand testimonials, and this ease of use on the tougher settings is enhanced by the fact that the peddling action is very smooth. This may be the benefit that buyers mention most but there are plenty of other advantages that have been highlighted. Many talk about the ease in assembling and adjusting this bike, as the seat and handlebars can be easily repositioned to suit even the shortest riders. It also has quite a small footprint and is surprisingly quiet for a chain bike, both of which are ideal for a home machine; and the functions of the computer are also well-received. 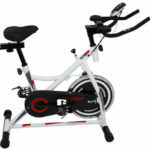 If there are so many advantages to the design and function, does this CrystalTec Aerobic Exercise Bike have any flaws? Encouragingly, the majority of negative comments, when they are not about faulty items that are later replaced or issues unrelated to the actual product, are just small niggles and suggestions rather than criticisms. Probably the biggest of these regards the idea of the “comfortable, padded saddle with anatomical cut-out”, which is apparently so uncomfortable that buyers have felt the need to buy the gel seat that is sold separately. In addition to this, there are some problems with the alignment of bolts when assembling the bike and the suggestion that the display could be a little larger so it is easier to read the data while in the middle of a session. 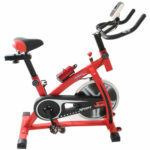 Summary: who is this CrystalTec Aerobic bike best recommended for? 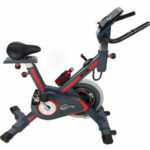 This product is seen by many reviewers as the ideal spin bike and it is easy to see why when the biggest complaints are the comfort of a seat that can easily be replaced and the size of the display. This is a great machine that does more than buyers expect because of its ability to take a beating and the options for a really tough session and, as a result, this CrystalTec bike is highly recommended to any buyer looking to get fit through spinning and those that are really committed to training as they will get the most out of this well-designed, capable machine.